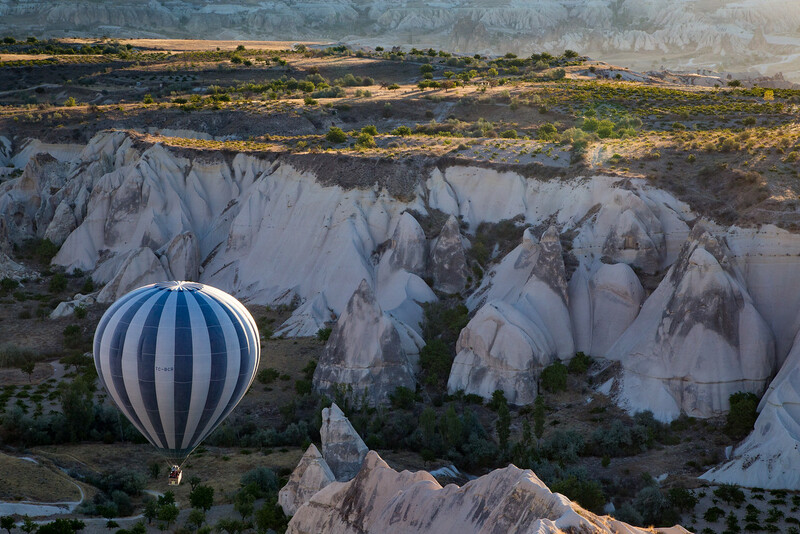 Besides staying in a cave hotel, another thing I wanted to go hot air ballooning in Turkey and photograph the amazing landscapes of Cappadocia from the sky. I had been hot air ballooning in Houston once and loved it, but I always wanted to try it again somewhere, where the landscapes consist of more than freeways and office parks. 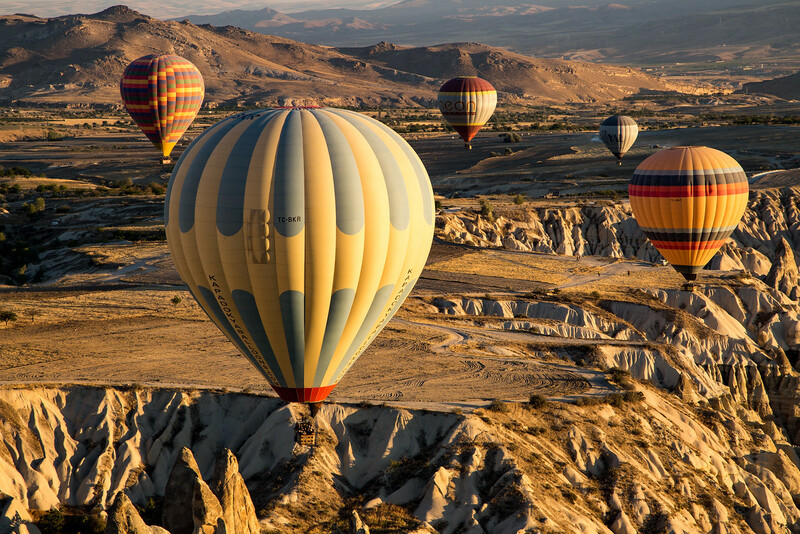 The opportunity to go hot air ballooning in Turkey and bring my camera and make some images of the fairytale landscapes of Turkish Anatolia from the basket of a hot air balloon was irresistible. I didn’t know exactly what equipment to bring along for photographing on a hot air balloon ride, but ultimately I decided to travel light and bring on my Canon 6D with my favorite traveling lens the Canon 24-105 L and my iPhone to record video. I think given the distraction that changing lenses would have been in the crowded balloon basket, the basket held about ten people plus the pilot, these turned out to be pretty good choices. 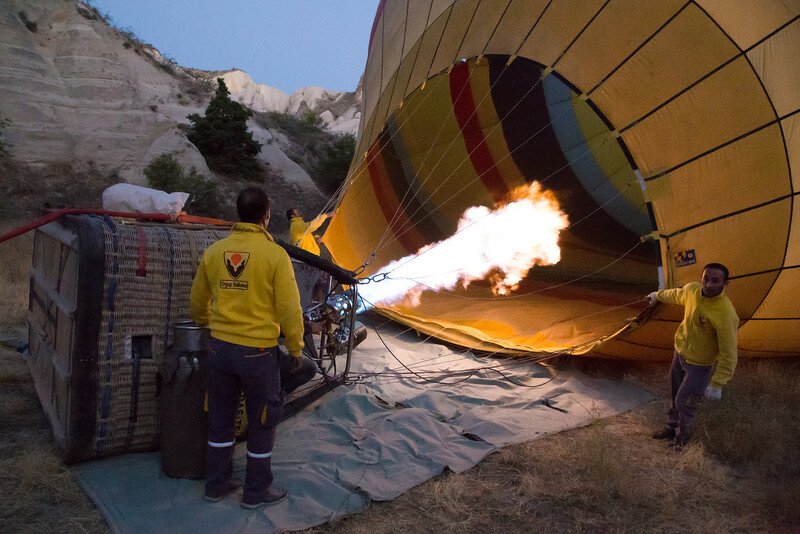 I was so excited about going hot air ballooning in Turkey that I woke up before my 4:30 AM alarm. I was met by ground transportation at my cave hotel at 5 AM and was driven about ten minutes to the Urgup Balloons office for coffee, to pay (€130 to €150 Euro depending on the season), and to fill out a little light paperwork. I met a number of people at headquarters, from all over the world, of all ages and nationalities, but one thing we had in common was the excitement of the upcoming adventure. With the formalities completed, we drove in the dark through the countryside, down a smooth dirt road and we arrived at the launch site just before 6 AM. The ground crew was there already, using a huge fan to prefill the “envelope” with air before they began using the burner to give it lift. It was just beginning to get light as we climbed into the basket. A few puffs from the burner and we were airborne. You could barely feel that we had left the ground, but there were more than a few “ooh’s” and “ahhs” as we cleared the nearby pinnacles by inches and climbed into the brightening sky. We had just reached our maximum altitude of around 3,000 feet as the sun broke above the horizon. It was one of the most satisfying sunrises I have ever experienced and was like a kid twisting my neck to see everything and soak in the scenery. 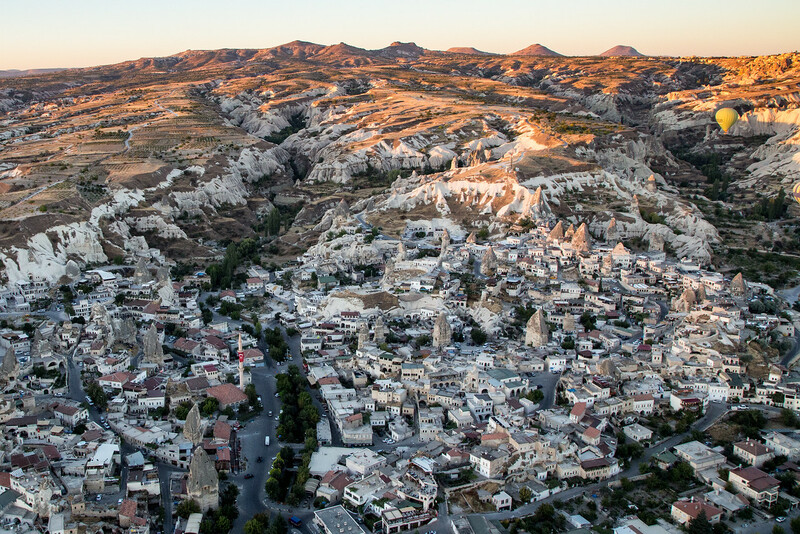 After a good scan from on high, seeing Goreme and the massive volcano, Mount Erciyes, far to the east we began our descent into a narrow valley. 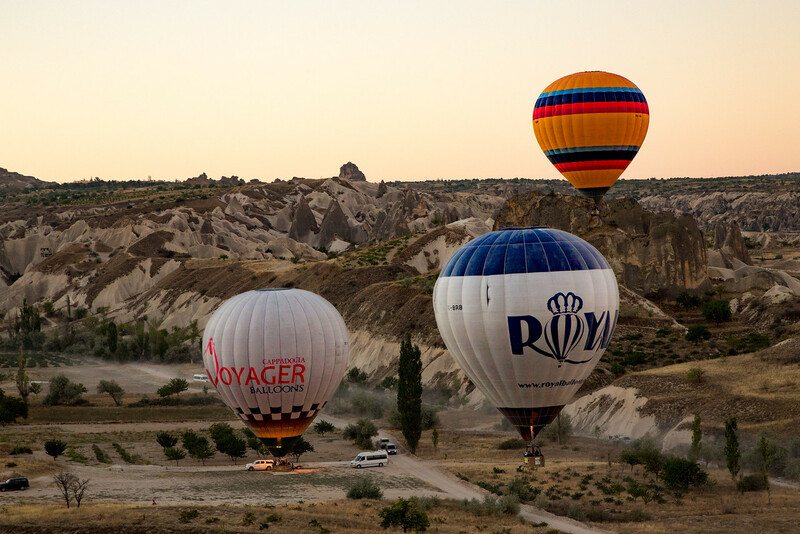 The pilot was skilled enough that not only were we able to fly above the landscape, we were actually able to fly in the valleys among the pillars, pinnacles, cones, and fairy chimneys that make up the unparalleled Cappadocian scenery. Toward the end of our one-hour flight, we spotted the ground crew in place, ahead and below us. The pilot had demonstrated a lot of skill, but when he said “I think I will just land on the trailer,” everyone laughed, but he was serious. He radioed something to the ground crew and, to the amazement of everyone, gently touched down directly on the transport trailer. I got out of the basket, but still had that lighter than air feeling. 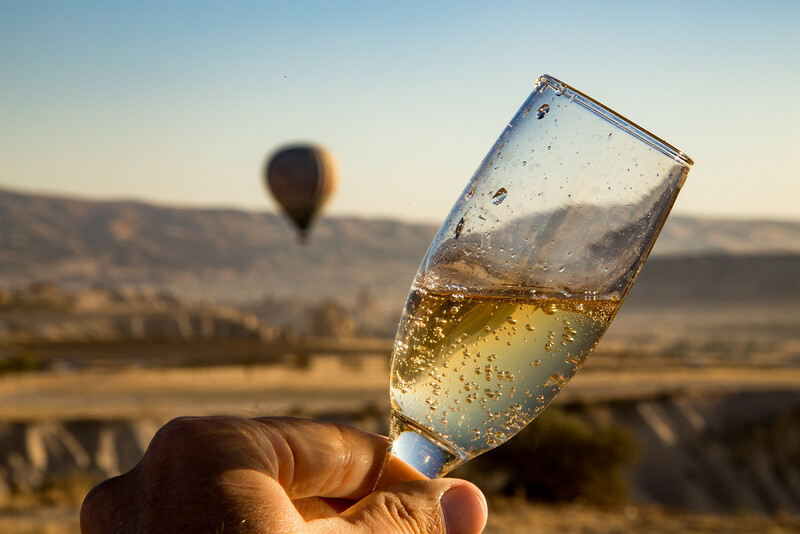 There was the traditional glasses of “champagne” waiting and we all toasted our little adventure together. Very nice. I’ve gone ballooning in upstate New York, but the terrain here looks just a wee bit different. Thanks for sharing! Thanks, Stephen! I just spent the whole time with my jaw dropped! Woa! What are we Jonathan – twins on the same travel trajectory? I just returned from a 6 week skip through the Balkans and Turkey and have been catching up on (the boatloads of) blogs in my Feedly. I seriously enjoyed (and shared!) your “Awfulizing” post earlier today, and now… this. 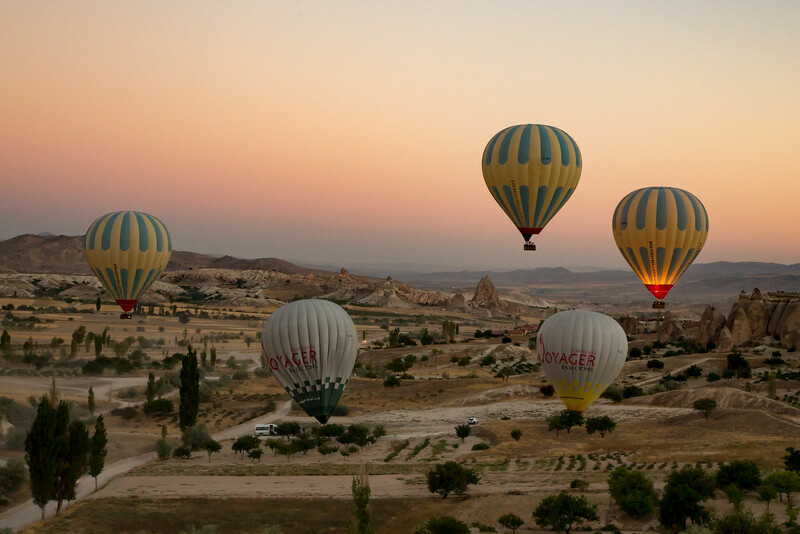 It was just 11 days ago that I too was ballooning above those same magical fairy chimneys at Cappadocia. I haven’t yet had a chance to edit my own images and vids, but I must say – if they’re even HALF as good as yours, I’ll be one lucky traveler! Nice job on your video – watching it brought the memory of my own recent flight flooding back. I can’t wait to get to the Balkans. With my schedule it is looking like Autumn 2017!